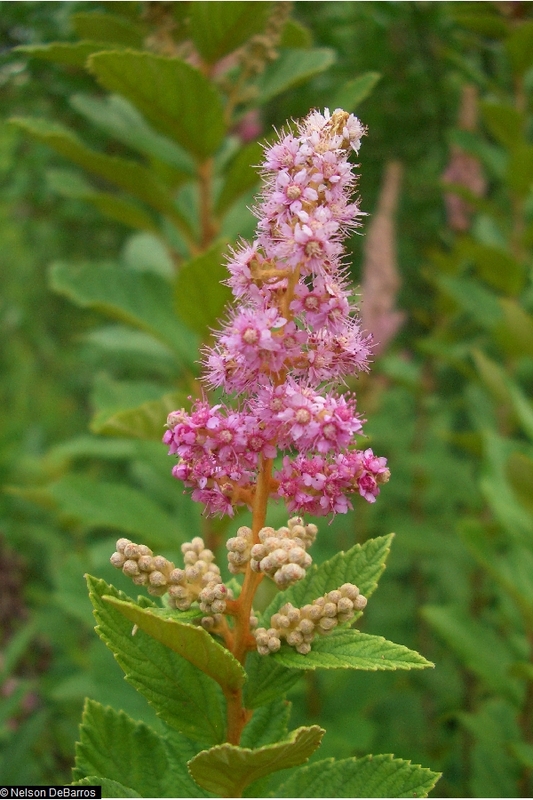 Spiraea tomentosa.© Nelson DeBarros.plants.usda.gov (Accessed 5/2014). Spiraea tomentosa is a shrub to 1 m tall; twigs wooly, delicate; colonial from root sprouts. Leaves alternate, to 5 cm long, egg-shaped to lance-shaped, pale or rusty wooly below, veins conspicuous. Flowers pink, 0.3 cm wide; inflorescence dense, terminal, to 15 cm long, branched, narrow; blooms July-Sept.
Fruit small hairy capsule, brown, persistent through winter; seeds very small, linear. Habitat: Undisturbed open marshes, and pond edges. Prefers soil pH 4.5-7 (USDA, NRCS 2010), tolerant of flooding, drought, soil compaction. Intolerant of salt, shade (Hightshoe 1988). Affected by the same insects and pathogens as S. alba.